“Welles,” Belles, and Fred Allen’s Sonic Pranks: Making a Radio Auteur Laugh at Himself | Sounding Out! When scholars discuss the effect of that play on people, they often fall into reveries about its most serious dimensions — what the Martian Panic says about human susceptibility, about the power of the media, about sound and the unknown. But it’s important to realize that, besides being terribly humorless, this approach also isn’t historically just. Although Welles was — like some of his listeners — spooked the night of the event, in the days that followed he and many others came to recognize some humor in the the whole thing, too. Later in life, Welles focused on that dimension of his memory, repeatedly recalling with laughter that when the actor John Barrymore (something of a “grand old man” of the American stage in 1938), heard the Martian invasion broadcast he tearfully decided to free his beloved dogs, so they could taste freedom before meeting the inexorable doom. Such tall tales aren’t trivial. Actually, we misunderstand the WOTW escapade if we don’t recognize that immediately adjacent to modern America’s propensity for panic stood its equally fascinating capacity to laugh at itself. Both tendencies do cultural work, often in concert with one another. With that in mind, this week our Mercury to Mars series moves from the macabre (see Debra Rae Cohen’s piece on Welles and Dracula) to the ridiculous, focusing on the relationship between Welles’s puffed-up fame and how it was lampooned by Fred Allen, one of the great absurdist comics in modern entertainment, and perhaps the most creative radio comedian of his era. To introduce this crucial entertainer and to explain why his relationship to Welles matters so much, we are lucky to have one of the most important voices in radio studies today: Kathleen Battles, Associate Professor of Communication at Oakland University, author of a paradigm-shifting study of the relationship between radio and policing, Calling All Cars: Radio Dragnets and the Technology of Policing (Minnesota, 2010). 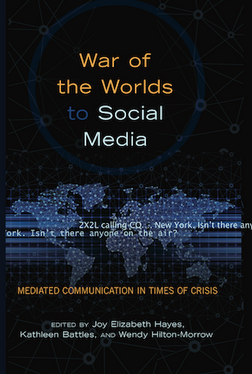 Battles is also one of the co-editors of a book you should all be reading, assigning, and handing out like Halloween candy — War of the Worlds to Social Media: Mediated Communication in Times of Crisis (Peter Lang, 2013). Here’s a taste, just to get you started. Contemporary public memory of Orson Welles seems bent on remembering him as mercurial, imperious, haughty genius, driven in equal parts by ambition and artistic vision. 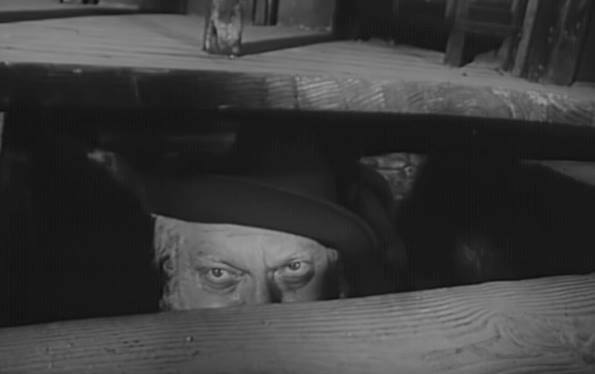 It is hard to remember that this image of the auteur – not Welles but “Welles” – was one crafted not by the man alone, but by a host of actors and other performers, all with their own interest in attaching themselves to such a “genius.” As Welles’s reputation grew in the wake of the “War of the Worlds” broadcast, furthering his transformation into “Welles,” it was simply a matter of time before he became a fodder for another kind of auteur, the radio comedian. 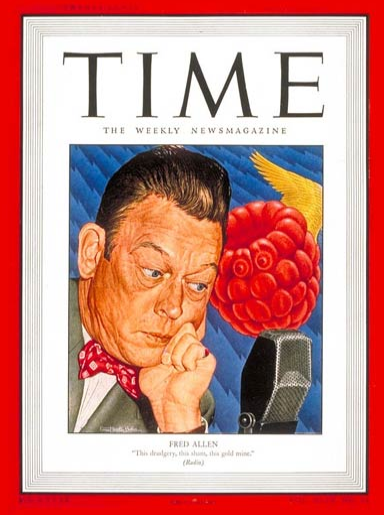 One of the most popular was Fred Allen, who made a career archly satirizing the cultural conventions of the day, with the radio industry itself being one of his favorite targets. “Welles” was too rich a subject to forego. This post explores two key moments of Allen’s satire. The first came on November 9, 1939, when Allen’s show featured a comic skit, entitled “The Soundman’s Revenge, or, He Only Pulled the Trigger a Little, Because the Leading Man was Half Shot Anyway,” a radio skit that deftly mimes the Mercury/Campbell style to comic effect. The second is from three years later, October 18, 1942, when Welles himself appeared on Allen’s show, joining in the fun as the pair rehearse Les Miserables, with Welles gamely mocking “Welles.” In these two short skits, Allen and his team of writers and performers quickly dismantle what had become the more recognizable elements of the Mercury/Campbell style–as exemplified in Welles’s version of A Tale of Two Cities–including the elevation of Welles to the genius “author” of the plays, its narrative and performance techniques, and the use of sound effects. 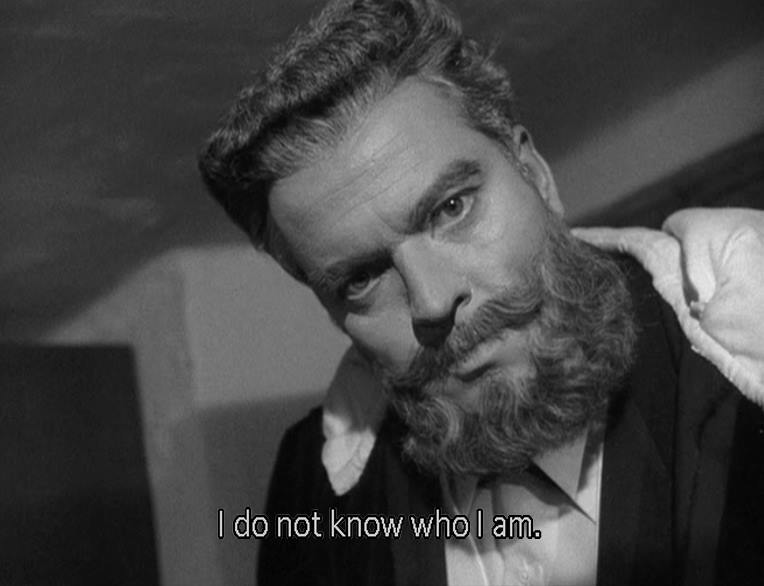 Orson Welles as Mr. Arkadin in his film of the same name, 1955. As other writers have pointed out, such as Debra Rae Cohen in her entry to this series, Neil Verma, and Paul Heyer, the show was among the best in emphasizing the sonic properties of radio to maximum effect in storytelling. The quality acting of members of the Mercury Theater, the music of Bernard Herrmann, the ambitious use of sound effects, and some stellar examples of adapting literary tales make the show worthy of praise. The emotional and narrative power of Welles himself is evident in the Mercury Theater dramatization of A Tale of Two Cities. Taking on Dickens’ sprawling classic in one hour certainly demanded some creative choices. One was to open with Dr. Mannette’s letter from the Bastille prison, with Welles as Mannette emotionally dictating the words that would later serve to betray his own family. This is contrasted against the later reading of the same letter in a courtroom scene, where the emotional poignancy of Welles’s performance is counterpointed against its dry reading as a piece of evidence. 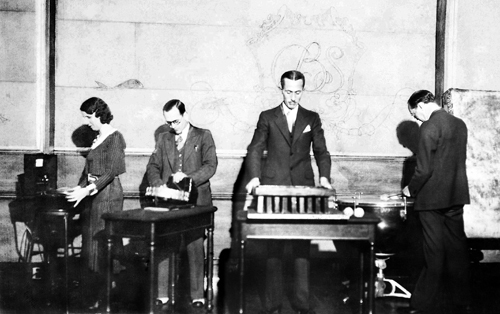 The sound effects team from The March of Time in a 1930’s publicity photo. On the left is Ora Nichols, who would later develop sounds for The War of the Worlds. Cover art for “Fred Allen Looks at Life,” a 1971 vinyl release by Bagdad Records. All of these tendencies are key to Allen’s “Soundman’s Revenge,” in which Orson Welles and the Campbell’s Playhouse become “Dorson Belles” and “Finnegan’s Playhouse,” with the evening’s entertainment an adaptation of Jack and Jill fetching a pail of water. The comic tour-de-force, however, comes with its satire of sound effects. Allen’s team goes for broke as listeners laugh along to the gradual undoing of the hapless Theodore Slade, Welles’s sound effects engineer in the skit, who is driven to madness by the excessive number of effects. Slade makes many mistakes throughout, but his errors really add up when Jack kills his father and he describes the “long arm of the law” reaching out, coming from the north on horseback, the east by train, the west by “aeroplane,” and the north by sleigh. Each description is punctuated by its appropriate sound; hooves, whistles, engines, and of course, sleigh bells. 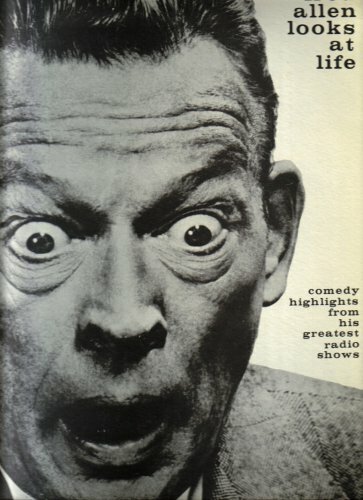 Fred Allen on the cover of Time, April 7, 1947. Art by Ernest Hamlin Baker. Perhaps Welles was offended, or perhaps he yearned to be in on the joke. He certainly seemed to relish the chance for that opportunity, when he appeared as a guest on Allen’s show, 3 years later on October 18, 1942. Here he plays along in the skewering of his own genius image, tied to his authorial control over all his projects. As the cast nervously awaits the arrival of the great “Welles,” Allen tries to calm them. Once “Welles” enters the studio, Allen himself comes in for his own ribbing. “Welles” tells him that they will be performing a new version of one of Welles’s early radio dramatizations, Les Miserables. Here Welles successfully mocks both “Welles” and Allen, insisting on sole authorship, giving an overwrought performance, using the first person singular mode of delivery, and most humorously by reducing Allen’s contribution to a few sound effects. In those few moments where Welles himself cannot help from laughing along with the mockery, “Welles” becomes Welles, and we in the audience get to laugh with, not at, the man. While CBS, Campbell Soup, and the press turned Welles into “Welles,” Allen undermined that move, puncturing the grandiose myth, a project in which Welles himself was only too willing to participate. By breaking it down to its constituent elements, the “Soundman” and Les Miserables skits celebrate the unique style of the Mercury/Campbell radio productions. Yet, they also pierce its cultured veneer by pointing to the unsung efforts of the always-necessary team to make radio performances work, and skewering the pretentiousness of the program’s extra-textual discourses. In the process Welles and Allen mutually constructed and deflated each other’s reputation as radio geniuses. Orson Welles as Falstaff in his Chimes at Midnight, 1965. Featured Image: Orson Welles and Anthony Perkins sharing a laugh on the set of The Trial. Kathleen Battles is Associate Professor and Graduate Director in the Department of Communication and Journalism at Oakland University (MI not CA). She is recently co-editor (with Joy Hayes and Wendy Hilton-Morrow) of War of the Worlds to Social Media: Mediated Communication in Times of Crisis (Peter Lang, 2013), a volume that seeks to draw connections between the War of the Worlds broadcast event and contemporary issues surrounding new media. 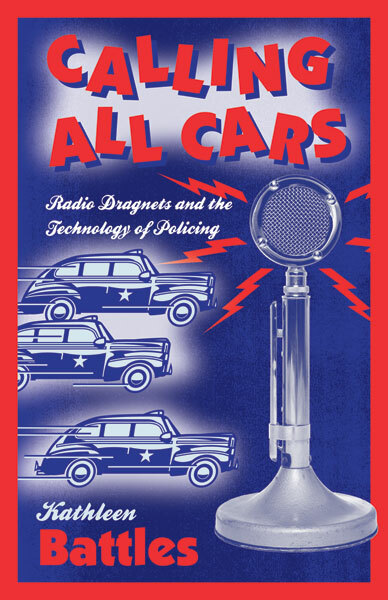 She is also the author Calling All Cars: Radio Dragnets and the Technology of Policing (University of Minnesota Press, 2010). Her research interests include Depression era radio cultures, the interrelationship between radio, telephones, and automobiles, media and space/time, the historical continuities between “old” and “new” media, and contemporary issues surrounding sexuality and the media. Want to catch up on the Mercury to Mars series? Click here to read Tom McEnaney’s thoughts on the place of Latin America in Welles’s radio work. Click here to read Eleanor Patterson’s reflections on recorded re-releases of the “War of the Worlds” broadcast. And click here to read Cynthia B. Meyers on the challenges and rewards of teaching WOTW in the classroom. While I’ve still got you here … be sure to join our WOTW anniversary Facebook group. Next month we’re planning exciting events around the anniversary of the Martian Panic on October 30, 2013 from 7-10 EST, and hoping to get as many of you as we can to liveTweet the Invasion broadcast. Sign up to join in! David and Cynthia – Thank you for the comments! The Soundman’s Revenge is one of my favorite bits of old radio. And as David rightly points out, capturing the richness of Allen’s humor is difficult in print – I was glad for this opportunity to include sound. I love the Finnegan’s Fishcake ad too! There was so much more in this skit that I wanted to touch on, but couldn’t in this limited space. Just moving on to the 1942 episode meant that a lot had to be cut out. The Jack Benny skit is also funny! I think we remember Welles today as such as caricature, that its great to remember that he was in on the joke. The link between Benny’s and Welles over inflated egos works well. But I always find something more biting about Allen. Enjoyed this piece so much! The “commercial” for Finnegan’s Fishcakes was very amusing–it comments on the absurdity of commercial interruptions mid-narrative, not to mention the overkill of the hard sell. I couldn’t access the 1942 program 😦 Any tricks to try? This is wonderful Kathleen! Fred Allen is so deft and detailed and hard to capture in transcript (and so little remembered now) that his work really rewards the kind of close attention to detail you give here.